(Krupien, 2007) height 34 in, bloom 4.5 in, season MLa, Dormant, Tetraploid, Fragrant, 14 buds, 3 branches, Gold with variable red mahogany broken overlay above orange throat. (unknown × unknown) Pod and pollen fertile. 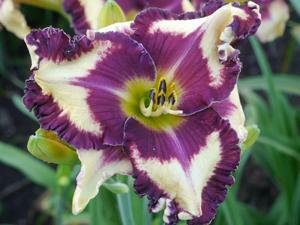 Will produce striped flowers when used with another broken color flower. 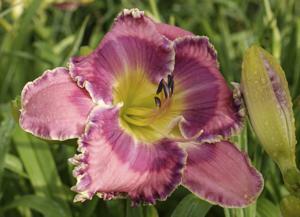 Kendig 2012, height 34", 5" bloom, season M but seems to bloom forever, tetraploid, 4 branches, 30+ buds. Coral flower with BLACK eye and thin black edge. Often "black" is just dark purple but this color is definitely black. Very distinctive. 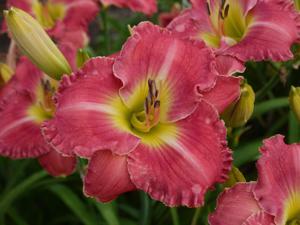 ( (seedling x Red Menace ) x Spacecoast Shiner)). 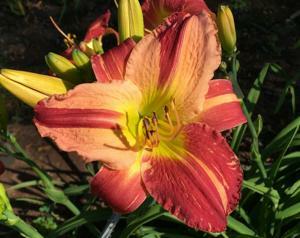 Kendig 2014, 26" tall, 4", season M, SEV foliage, tetraploid, 5 way branching and 30 buds. Dark coral flower with near black eye and edge. Black Ops has lots of buds and the branches are widely spaced to facilitate flower opening. This probably is a sib to Black Heart with better branching and a more complete edge. The black is not as black as Black Heart. Very unusual. 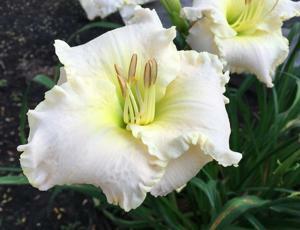 Kendig 2017 height 32" bloom 4 1/2" season M SEV, tetraploid, 5 branches with 30+ buds. 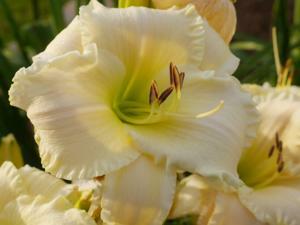 Flower is a very green shade of yellow. The reason to grow Build Me Up Buttercup is for the fantastic scape and branching and buds. A great garden performer. The song, by the way, was released in 1968 by the Foundations. Kendig 2009, 24" tall, season ML, dormant foliage, tetraploid. 4 1/2" bitone flower with deep lavender petals contrasting with pale, almost white sepals. Sepals are streaked with violet. Throat is surrounded with watermark. 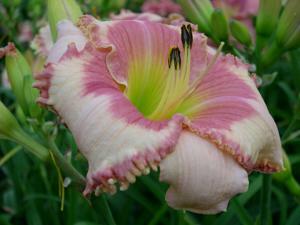 Kendig 2008, 53" tall, season Mid-late, dormant foliage, tetraploid. 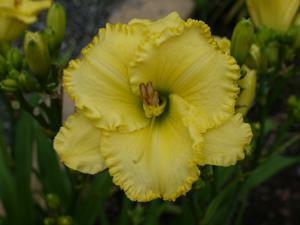 This flower is a clear colored but unremarkable 3.5" yellow flower that blooms on a 53" tall scape. 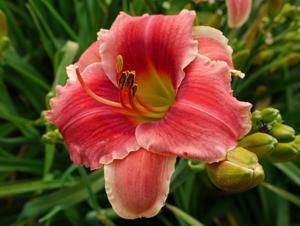 With 40+ buds on 7-way branching it is great garden performer and is much appreciated by knowledgeable gardeners. Many people saw this plant as a fantastic clump in the Sterrett garden in 2017. Truly a great garden performer. Kendig 2015, 32" tall, 6", season EM, dormant foliage, tetraploid, 3 way branching 20 buds. Reblooms. 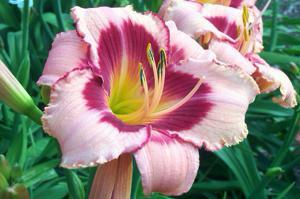 Pink flower with orange-gold edge has been an obvious introduction since its first bloom. 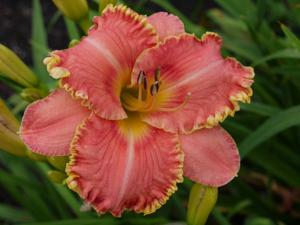 The combination of the gold edge over the pink flower often appears as an orange edge. 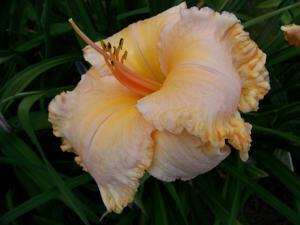 My observation notes on this flower over the past five years alternate between describing the edge as gold or orange. Kendig 2917 height 26" bloom 4 3/4", season EM Dormant ReBloom tetraploid. Pale yellow flower with red eye and edge. 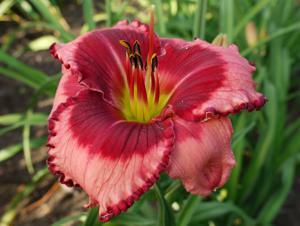 Red edge is complete on the petals but is especially wide at the corner of the petals. 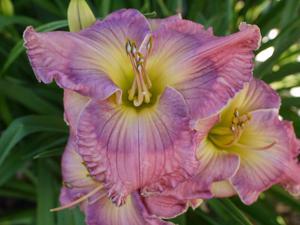 I have not seen these corners on other daylilies and the look is unique. Kendig 2011, 30" tall, season M, SEV foliage, tetraploid. 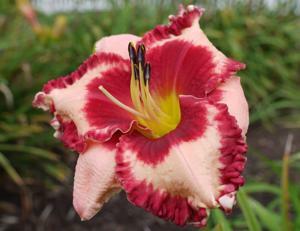 5 1/4" rose colored flower with 3" wide petals and outstanding substance. Nice branching and immediate rebloom (a fan will send up a second scape before the 1st scape has completed blooming). Kendig 2016, 32" tall, 5" season M, SEV foliage, tetraploid, 20 buds in full sun, 14 buds in partial shade. Deep purple flower with near black edge and large eye. 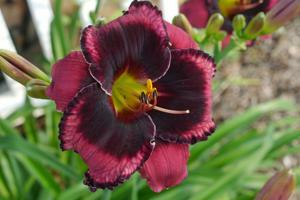 Fantastically rich color, especially in the morning and in partial shade. Consistent performer. (Ruby Red Ripples x Phillies Starter). (Howard-R., 2013) height 38in (96cm), bloom 7in (18.0cm), season La, Dormant, Tetraploid, 20 buds, 4 branches, Unusual Form Crispate-Cascade-Spatulate, Yellow with variable, red, broken, overlay. 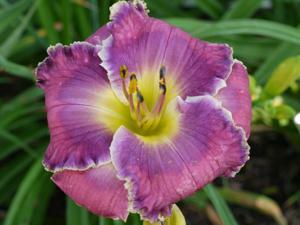 (Flying Trapeze × Webster's Aggie) I have used this striped flower on a variety of other broken color daylilies and am seeing a good percentage of striped seedlings. 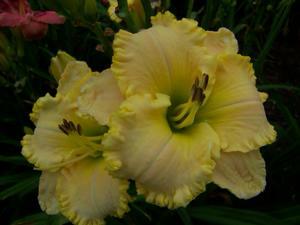 Yancey 1980 height 29 in, bloom 5 in, season EM, Semi-Evergreen, Diploid, Near white self with yellow green throat. 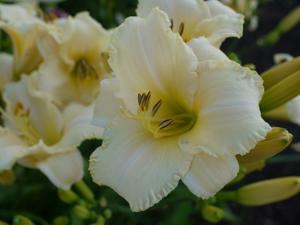 Gentle Shepherd and Sagarmatha are the two whitest daylilies available. Gentle Shepherd is not a vigorous grower. Kendig 2014, 26" tall, 6", season M, SEV foliage, tetraploid, fragrant, 16 buds and rebloom which provides long bloom season. 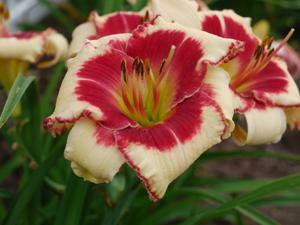 Flower color is near white (pale yellow) with wide petals and excellent red color on the eye and petal edges. 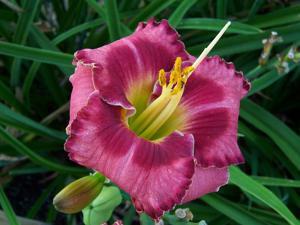 While many of my red edge flowers have been recurved, this flower opens flat and shows off its complete red edge. This is my most used parent because its flat opening habit better presents the wonderful edge. 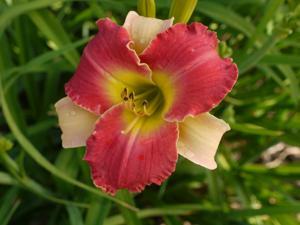 In my seedling field of many red edges, this flower is an eye magnet. Parents are two of my red edge unintroduced seedlings, 06-27 x 06-24. 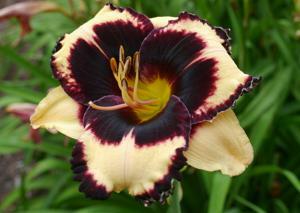 Kendig 2011, height 30", bloom 6", season M, SEV, tetraploid, fragrant. Tangerine self with more color saturation at the throat and within the heavy pleats. Pistols are matching color and only the black anthers contrast with this beautiful flower. 3-way branching and 14 buds. ( Flamenco Twirl x Spacecoast Discovery). 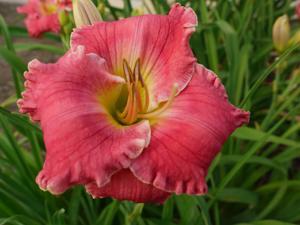 Kendig 2011, height 28", bloom 6 3/4", season M, dormant, fragrant, tetraploid. Pink flower with 3 1/4" wide petals and rose veins, gold edge and clear yellow throat. 4-way branching and 24 buds. Flower has lots of substance. Kendig 2017 height 32", bloom 6", season M, Dormant, tetraploid, 24 buds, 4 branches. Purple edge and eye on very pale yellow flower with widely spaced branches. Very bright and clear purple color. (Doug Warner x Phillies' Starter) Awards: JC was deferred in 2017 and will be awarded in 2018. Kendig 2009 34" tall, season M, SEV foliage, tetraploid. 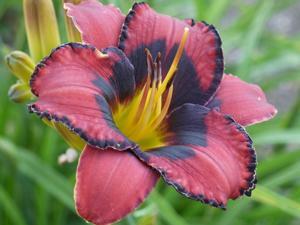 6" tangerine flower has a huge red eye and creamy edge. Nice branching and bud count. Kendig 2015, 32" tall, 4 1/2", season M, dormant foliage, tetraploid, 4 way branching with 20 buds. Purple with dark purple eye and a double edge of purple and gold. 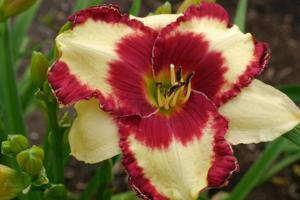 I have had many more requests for Rich Howard (seedling 16-08) than I have plants available. 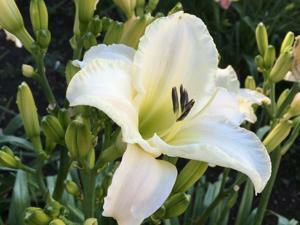 In August 2019 I will offer this plant on the Lily Auction for delivery in early September. 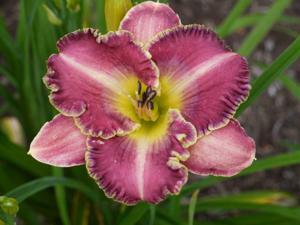 Plant is named, of course, for the Connecticut daylily hybridizer Rich Howard, who brought us the excellent and important plant, Explosion In The Paint Factory. Elliott 1984 height 27 in, bloom 6 in, season VLa, Rebloom, Semi-Evergreen, Diploid, Fragrant, Near white self with olive green throat. 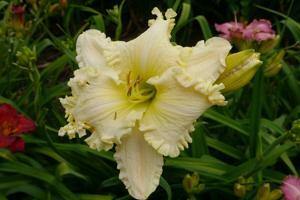 (Agape Love × White Temptation) Sagarmatha and Gentle Shepherd are the two whitest daylilies available today. Kendig 2008, 36" tall, season M, dormant foliage, tetraploid. 6" pink flower with watermark and lime green throat. Pleated double flower edge of pale pink and gold. Form is beautifully recurved and the flower is diamond dusted. Kendig 2015, 26" tall, 5", season M, SEV foliage, tetraploid, 3 way branching and 12 buds but rebloom extends it's blooming season. Pink flower with red eye and the widest (1/2") red edge I have offered in my line of red edge introductions. 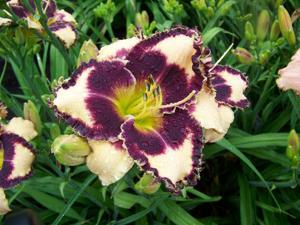 The wide edge and its color contrast with the flower attracts visitors to this flower. Kendig, 38" tall season early-mid, SEV foliage, tetraploid. 5" pink flower with red eye. Consistent re-bloomer. A second scape grows out of the same fan before the 1st scape finished blooming. (Seifert, 2015) height 32in, bloom 7in, season M, Semi-Evergreen, Tetraploid, 10 buds, 2 branches, Purple with white streaks, chartreuse throat. (Swallow Tail Kite × Voices Carry) Pollen fertile, difficult as a pod parent. 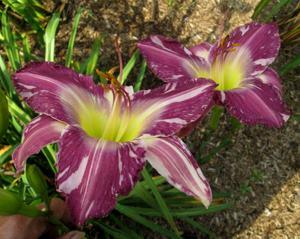 Every flower has displayed purple striping. Kendig 2006, 28" tall, mid-season, dormant, tetraploid. Huge 7" flowers with big crab claw buds.This has been my largest selling introduction each year since its introduction. The color and the multitude of blooms is a garden focal point. If you aren't yet growing this one, you should give it a try. 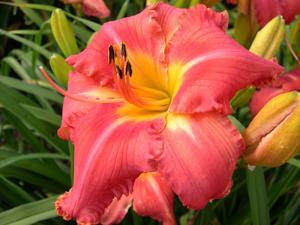 Kendig, 2010, 30" tall, 5" bloom, M, SEV, tetraploid. 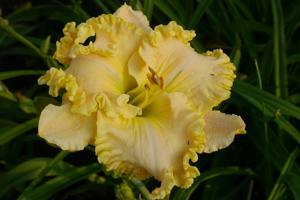 This fragrant full formed yellow has substance and 5 way branching with lots of blooms. This site has been accessed 1340324 times.